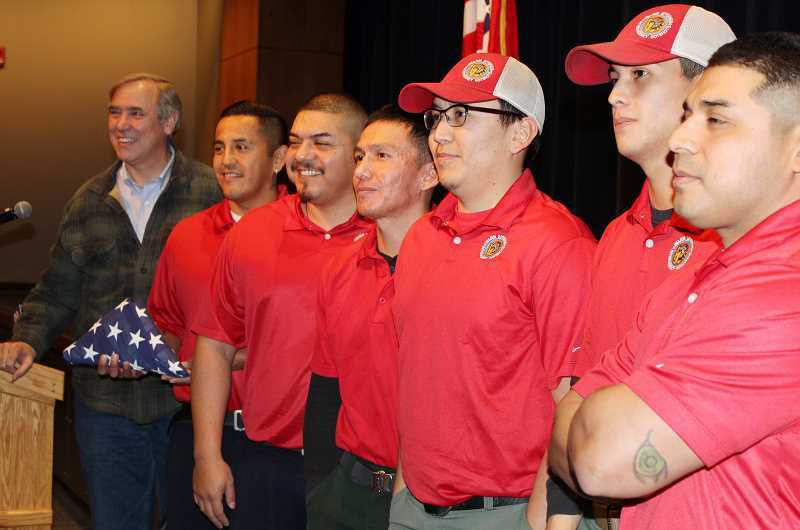 The senator honors Warm Springs Hotshots before listening to constituents at open meeting. Before returning to Washington, D.C., for the start of the 116th U.S. Congress this week, Sen. Jeff Merkley stopped in Madras for a town hall meeting Friday, Jan. 4. About 120 people attended the meeting, where the senator honored the Warm Springs Hotshots; spoke about the voter suppression and intimidation around the country in the November election; the tax cuts that benefitted the richest Americans; climate change resulting in low snowpack and more forest fires; and the partial government shutdown, now in its third week, which was at the top of the agenda when the Senate reconvened on Jan. 8. Kevin Smith, of Crooked River Ranch, asked how Merkley — a Democrat and member of the minority party in the Senate — will be able to move anything forward in the Senate. "It's very hard to get a bill on the floor; I'm hoping that changes," he said. "For years, I have been working with (Senate Majority Leader Mitch) McConnell, of Kentucky, on a hemp bill." That bill, legalizing the industrial farming of hemp, was included in the 2018 Farm Bill and passed with bipartisan support, he said. "We need to reach across the aisle." Joe Krenowicz, executive director of the Madras-Jefferson County Chamber of Commerce, noted that the uncertainty surrounding the president's tariffs on five companies at the Madras Industrial Site with about 1,200 employees, is impacting the companies' planning. Merkley said that he agrees with the president that manufacturing inequality is a big issue, but disagrees with the president's solutions. "There's not a coherent plan ... pick out a series of things and throw tariffs on them," said Merkley, who would like to see the trade deficit reduced in a more sensible fashion, taking wages and environmental rules into consideration. Eight-year-old Jacob Hurd, whose mother, Jamie Hurd, serves on the School District 509-J Board of Directors, read a statement and asked what could be done about underfunded schools and low graduation rates. "In my second-grade class of 25, six won't make it," said Jacob. "Please help save our schools." 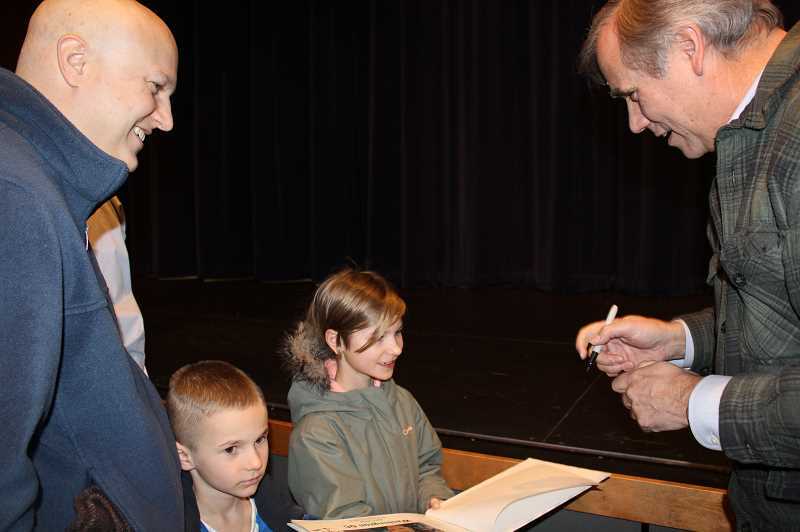 "We really have to invest in our children," said Merkley, including early childhood education, career and technical education, and community colleges. "Community colleges are still unacceptably expensive," he said. "It's a big deal." In response to questions about health care, Merkley said that the systems is a continual stessor for people, who have to figure out what happens when they no longer qualify for a plan or how to get coverage in the middle of the year. "We're far from having a cost-effective system," he said. "We need to have seamless Medicare for all." In November, Merkley introduced a bill to lower prescription drug prices, "taking on drug companies and the gouging of Americans." Citing the cost of a vial of a seizure drug, which is $40,000 for U.S. citizens and $200 for Canadians, he said, "We should get the lowest prices in the world, not the highest." "About two weeks ago, our president said he would like to see a referenced bill on drug prices; I had hopes. But now, I'm not so hopeful," said Merkley, noting that drug companies spent massive amounts to stop the bill. Asked about foreign aid, Merkley said that only a small percent of foreign aid is spent overseas. Most is given as grants that have to be spent in particular ways. "Soft power is power," he said, noting one of the benefits of assisting other countries. "We can have power through relationships that are established." After 9/11, he said, "The world responded, 'You helped us; we'll help you.' We're losing our soft power." Chris Scranton, of Madras, expressed concern about the Bears Ears National Monument and the Arctic National Wildlife Refuge being opened for fracking. "We all own these lands," he said. Merkley emphatically agreed, pointing out the "tremendous amount of disturbance" where oil exploration is occurring, with the use of explosives. "It's an absolute jewel," he said, referring to the wildlife refuge. "We have to stop doing one more fossil fuel project after another."